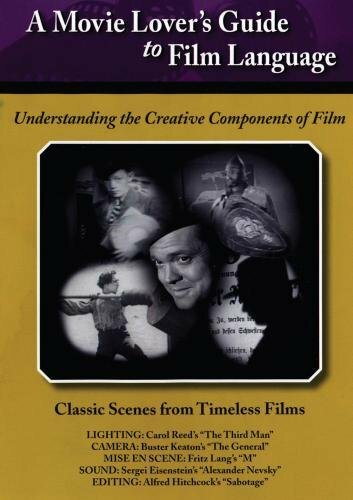 Classic Scenes from Timeless Films - Learn How To Understand the Components of Film. The program consists of a general introduction to film language and five "lessons" covering the major elements of cinematic language: LIGHTING, CAMERA, MISE EN SCENE, SOUND and EDITING. For each of these lessons there is a short overview to introduce the lesson and its film clip, which consists of an "original clip" of a scene from a classic film. This is followed by an "instructional clip" that shows the same scene again but with synchronized voice-over commentary about the use of film language it illustrates. The movie scenes come from recognized film classics such as: Carol Reed's "The Third Man" (Lighting), Buster Keaton's "The General" (Camera), Fritz Lang's "M" (Mise en scene), Sergei Eisenstein's "Alexander Nevsky" (Sound), and Alfred Hitchcock's "Sabotage" (Editing). This program is interactive allowing students to go directly from the introduction, to any of the five lessons, to supplementary information about the classic films or to the glossary of film terms used in the program. If you have any questions about this product by TMW MEDIA GROUP, contact us by completing and submitting the form below. If you are looking for a specif part number, please include it with your message.